Jean Clottes renowned expert on prehistoric rock art, explores the origins of rock art and creativity, taking the reader on a guided tour of 85 rock art caves and rock painting shelters, revealing the extraordinary beauty of the cave paintings and Palaeolithic Cave Art. The discovery of prehistoric decorated caves in western Europe transformed the way we think about the development of art. The earliest known evidence of human artistic endeavour, the awe-inspiring paintings, dramatic engravings and small, delicate sculptures of animals and humans found in these caves still hold a unique power and fascination, more than a century after they were first discovered. In this book, internationally renowned expert on prehistoric art Jean Clottes explores the origins of art and creativity. He takes the reader on a guided tour of 85 caves and rock shelters, many of which are not open to the public, revealing the extraordinary beauty of the works of art within them. Cave Art features more than 300 works from the Palaeolithic period, made between 35,000 and 11,000 years ago, presented in geographical and chronological order. Each work in Cave Art is illustrated by a colour photograph, and accompanied by a clear, vivid explanatory text. The book also includes a chronology, maps of the main caves and sites, a glossary and a list of sites that can be visited. With an unparalleled selection of images, Cave Art offers a unique guided tour of the earliest expressions of human creativity. To date he has written over 300 scientific papers, and has edited, co-edited, written, or co-authored a total of over 20 books. He has also lectured around the world, taught at the University of Toulouse and the University of California at Berkeley, and engaged in numerous public outreach and professional service activities. He has received several honors from the French government and also from the Blue Tuareg people of the Sahara Desert, who made him an honorary Tuareg in 2007. How far have we come in the world of art? How did we reach a display of animals suspended in formaldehyde? What are the roots of our fascination with the representation of the real world through symbols? It is surely this explosion of symbolic thought and the beginning of modern man's creativity that we must investigate, and who better to do so than one of France’s most eminent prehistorians Dr. Jean Clottes. Cave Art, recently published by Phaidon, is an accessible yet definitive introduction to prehistoric art, using European Palaeolithic art during the Ice Age as its platform from which to explore the global phenomenon of rock art. With clinical precision, CAVE ART lays out the salient items for consideration. 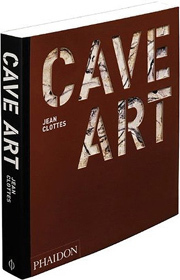 "I wanted to write a book on cave art with as much information as possible, but in the simplest possible form," states Jean Clottes. "It is directed towards people who know nothing about this, as well as to specialists". And there in lies its beauty. The artworks, presented with unparalleled quality, range from spectacular cave paintings to small, delicate sculptures, representing works from key sites such as Chauvet, Lascaux and Niaux in France, as well as less-known locations. Cave Art provides an explanation of who the artists were - 'our direct ancestors'. 'Cro-Magnons....were people like us,with the same brain, physical appearance, nervous system and cognitive abilities'. It considers what art is, using the Blombos haematite stone as the earliest possible art object attributable to modern humans. It presents the temporal context with a clear chronology, explaining the differences between the Aurignacian, Gravettian, Solutrean and Magdalenian cultures, and how these cultures created the art in an uneven geographical distribution. Cave Art then explores the techniques, the themes, the possible meanings and the numerous interpretations, establishing that 'even if none of [the] hypotheses can be accepted in their entirety, each still played a part in bringing about a better understanding of Palaeolithic art'. After a long and full career of academic and objective examination, in Cave Art Jean Clottes creates a compelling and highly-plausible picture of an overall belief system which persisted with little change for over twenty millennia, ending only when the Ice Age finally drew to a close. Jean Clottes is a prominent French prehistorian. He was born in the French Pyrénées in 1933 and began to study archaeology in 1959, while teaching high school. He initially focused on Neolithic dolmens, which were the topic of his 1975 Ph.D. thesis at the University of Toulouse. After being appointed director of prehistoric antiquities for the Midi-Pyrénées in 1971, he began to study prehistoric cave art in order to fulfill the responsibilities of that position. In the following years he led a series of excavations of prehistoric sites in the region. In 1992, he was named General Inspector for Archaeology at the French Ministry of Culture; in 1993 he was appointed Scientific Advisor for prehistoric rock art at the French Ministry of Culture. He formally retired in 1999, but remains an active contributor to the field.